4.2 We're all mad here. Wahn bedeutet eine falsche, irrige Meinung, Einbildung, Täuschung, Betörung, die ein Einzelner oder mehrere in einem bestimmten Fall haben. Für ein weit blickendes Auge. Gar mancher Sinn ist ärgste Tollheit. Bestimmt die Mehrheit, was gilt. Stimmst du zu – so bist du vernünftig. Und wirst in Ketten gelegt. Weshalb werden Menschen auf dem Weg zur Selbstermächtigung verrückt? Wie kommt es, dass Verrücktheit wesentlich wird auf dem Weg zur zunehmenden Erfüllung des Selbst mit göttlicher Wirkmacht? weil sie glauben, meine Tage hätten einen Preis. Protagonist, begabter junger Sportler: "Du hast den Verstand verloren, weißt Du das!" Tankstellenbesitzer Socrates: "Dafür habe ich ein Leben lang üben müssen." Wenn du zu Gott sprichst, nennt man es Beten. Wenn Gott zu dir spricht, nennt man es Schizophrenie. You ask me how I became a madman. It happened thus: One day, long before many gods were born, I woke from a deep sleep and found all my masks were stolen – the seven masks I have fashioned and worn in seven lives – I ran maskless through the crowded streets shouting, "Thieves, thieves, the cursed thieves." but we do not heed their cries, for we neither hear nor understand. But the man who hears and understands we call mad, and flee from him. Sometimes I forget completely what companionship is. Unconscious and insane, I spill sad energy everywhere. My story gets told in various ways: a romance, a dirty joke, a war, a vacancy. only the latter an illness. The fool says in his heart, 'there is no God' (Psalms 14, 1). What's the difference between the ego and the soul? [...] One has the stamina to be invisible, the other one doesn't. That is what you have as a possibility in you. But you have to become irrational. You have to become fully and totally mystically irrational. Not emotionally irrational, because that's self serving. You have to become mystically irrational. Mystically irrational means you have to become mystically fearless. You have to be able to do what your mind would give you logical reasons to not do. You have to be everything your soul beckons you to be and everything your mind tells you to be cautious about. You have to become forgiving. You have to become bold in a way that your soul recognizes. The mystical experience is about your capacity to perceive fully in a hologram at the speed of light to get the consequences of an action that your mind will say doesn't matter. But every part of your soul knows: 'This matters. This matters. Everything matters. Everything matters.' The soul measures everything and every piece of life matters to the soul. When someone says 'I can't deal with religion' I fully understand that. But [...] beyond religion and all the nonsense of religion [...] there are deeper Divine impulses that even our Founding Fathers recognized. And our nation is founded on these impulses by the way. The human being searches by nature for meaning and purpose, that by nature searches for truth. That the human being thrives better when his or her life is devoted to meaning and service than the absence of that. That the human being thrives better within a climate of hope than hopelessness. Alternative translation: "There was never a genius without a tincture of madness." It is notorious that brilliant people are often the most dense about their own human blind spot, precisely because their intelligence, so clever in other things, conceals it from them; multiply this situation a thousandfold, and you have a brilliant scientific and technological civilization that could run amuck out of its own sheer uprooted cleverness. The solution proposed by Greek tragic wisdom through the drama of Aeschylus may not, then, be as frightening as we imagine: in giving the Furies their place, we may come to recognize that they are not such alien presences as we think in our moments of evading them. The Apple Computer advertisement "Here's to the Crazy Ones" was adapted from the writings of Jack Kerouac. The unconscious overwhelms the ego-consciousness, the field of awareness. Schizophrenia is not really amenable to psychiatric control. Carl Jung] believed that "schizophrenia" is a self-healing process – one in which, specifically, the pathological complexes dissolve themselves. The whole schizophrenic turmoil is really a self-organising, healing experience. It's like a molten state. Everything seems to be made of free energy, an inner free play of imagery through which the alienated psyche spontaneously re-organises itself – in such a way that the conscious ego is brought back into communication with the unconscious again. [Donald] Trump's so-called madness is all over the place. He is out of control. […] We continue to open to the univited guest, we welcome him in, we don't reject him. Excess results in balance, eventually. Alternative version: "Those whom the gods wish to destroy they first make mad." Insects have compound eyes and two antennae. Gifted young athlete: "You're out of your mind, you know that?!" Peaceful older warrior: "It's taken a lifetime of practice." Crazy people don't know they are crazy. I know I am crazy, therefore I am not crazy. and when you are born in America you're given a front row seat. I am a notebook guy. Straight and narrow is the path. Waste no time or effort. Question: Dr Hawkins, could you talk about some of the differences between a state that might be psychologically destabilizing and one that might be spiritually growthful? And I’d get depressed. I've been called an autistic savant. I've been called bi-polar. I've been called multi-polar. I've been called empathic. I’ve had more psychiatrists and psychologists – believe me – try to examine me, try to figure out why I do what I do, and nobody really knows. Everything in this cosmos is about ratio and scales. To me a photon and an electron have a personality and a signature; they have a heart. Circular, intuitive, spatial logic doesn't occupy space. The Holy Grail of seamless transference of data is the SMART grid. It has more capacity as it has no binary 1s and 0s any more. Energy and information are the same. Conundrums are good. Everything is a conundrum, one way or the other. If you can't get through conundrums, you're not going to get away from paradox. If you can't get away from paradox, you're not going to get away from duality. The only differentiation is angular momentum and how you perceive it at that moment. Well, one of the fallacies of quantum mechanics is that by observing an object, you change that object. No. By observing that object you get hung up in Time; you change yourself, and the object changes you. Holophasec Energy translates circular feminine spatial harmonic language into logical straight linear dualistic language. Right brain communicating with the left brain. Definition of "deviant" and "deviance"
'or you wouldn't have come here. Dad: Yes, Alice, I think you are. But I’ll tell you something. All the greatest people are. Alice: There is no use trying, said Alice; one can't believe impossible things. Queen: I dare say you haven't had much practice, said the queen. I've believed as many as six impossible things before breakfast. Layers of reality exist side by side, frequently fusing into each other, and the acute self-awareness Mr. Sass calls hyperreflexivity, as well as a profound sense of alienation from the empirical world, run rampant. Sass denoted "striking similarities" between schizophrenia the workd of modernist art and literature as offered by Franz Kafka, Paul Valery, Samuel Beckett, Alain Robbe-Grillet, Giorgio de Chirico and Salvador Dali. 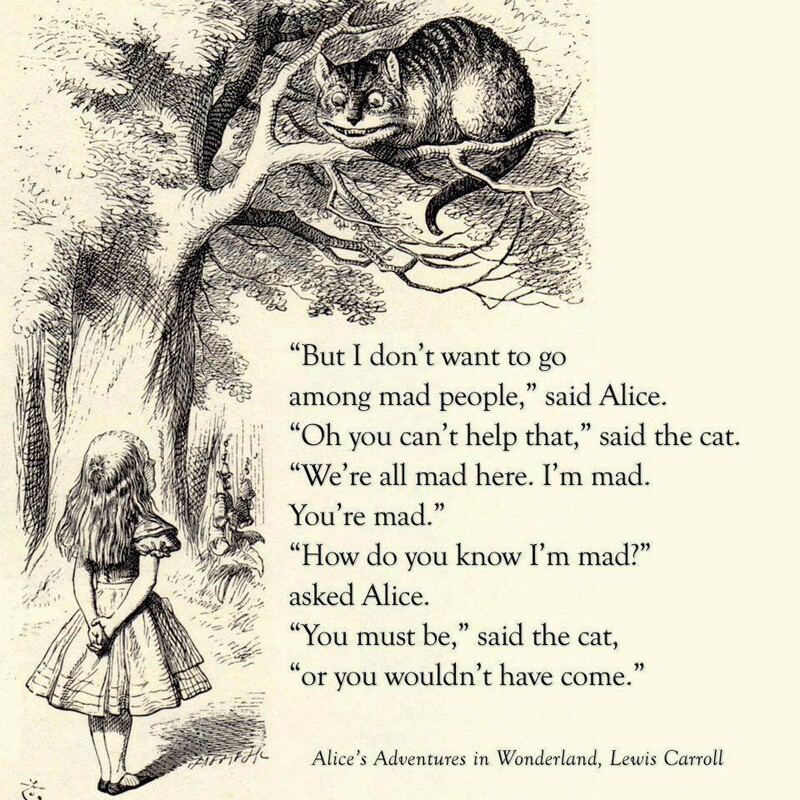 Madness is a is part of the psyche's self-healing dynamics when faced with seemingly irresolvable existential dilemmas. People who recover from these psychotic disorders do not merely return to their pre-psychotic condition, but often undergo a profound positive transformation with far more lasting benefits than harms. Thorough ritique of the medical-model, with a firm basis in scientific evidence. Critique of the studies suggesting a strong genetic component to schizophrenia cp. to a study that discovered that environmental influences (family dysfunction, etc.) have seven times more explanatory power than genetic predisposition, the use of anti-psychotics is often more harmful than helpful in the long-term (pp. 42-57). Nachlese des Psychiatrie-Justiz-Skandals um Gustl Mollath in Bayern – Hanna Ziegert bestätigt, dass Staatsanwaltschaft und Richter Gutachter je nach dem gewünschten Ergebnis beauftragen. Vorauseilend gehorsame abhängige Gutachter liefern i.d.R. das "gewünschte" Gutachten. Eine verzerrte Realitätswahrnehmung verhindert rationales Denken und Handeln mit gefährlichen Folgen für politische Entscheidungen. Um eine friedfertige und sozial gerechte Zukunft unserer Gesellschaft zu sichern, müssen die verdeckten psychischen Motive der Selbsentfremdung als Ursache der Irrationalität aufgedeckt und aufgelöst werden. "If you got an innovative idea and the majority does not poo-poo your idea then you must not have a good idea. It is not enough of a breakthrough to make that kind of a difference." "Acute psychosis is a healing process. Bipolar disorders can be healed."